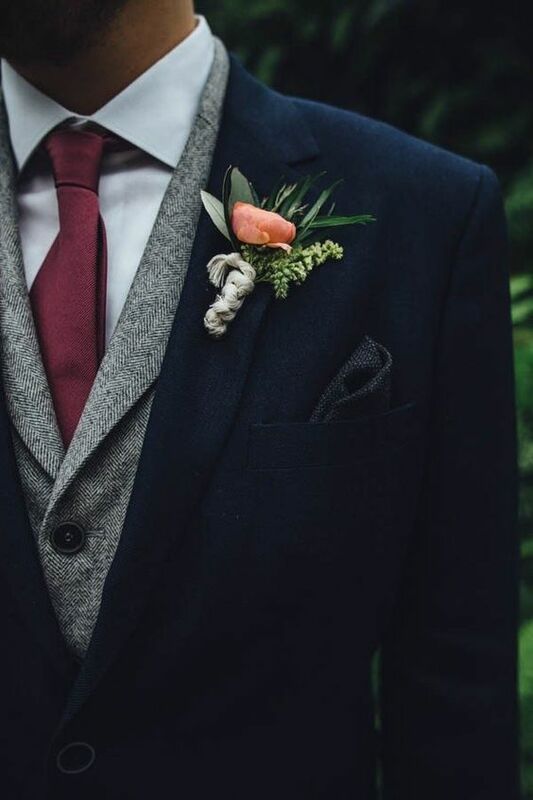 Dressing up for the fall and winter, which are rather cold seasons, may be a bit difficult because you need to look awesome and feel comfy and cozy at the same time – who wants to feel uncomfortable on the big day? 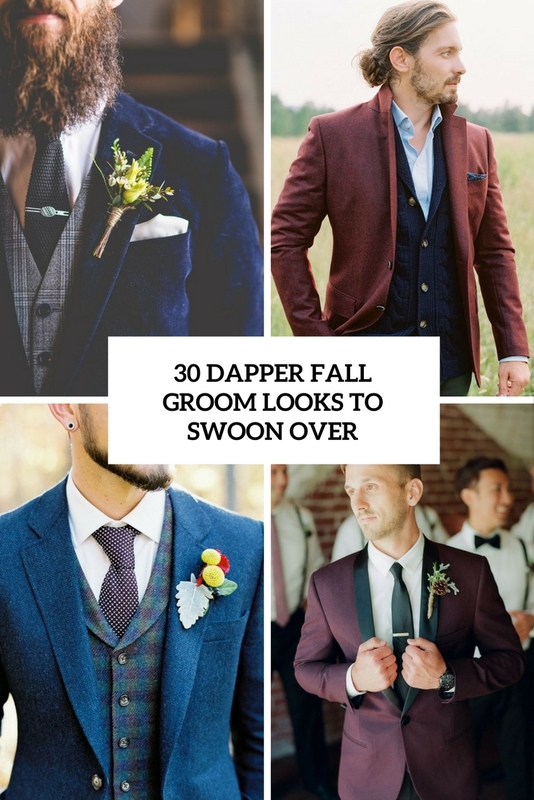 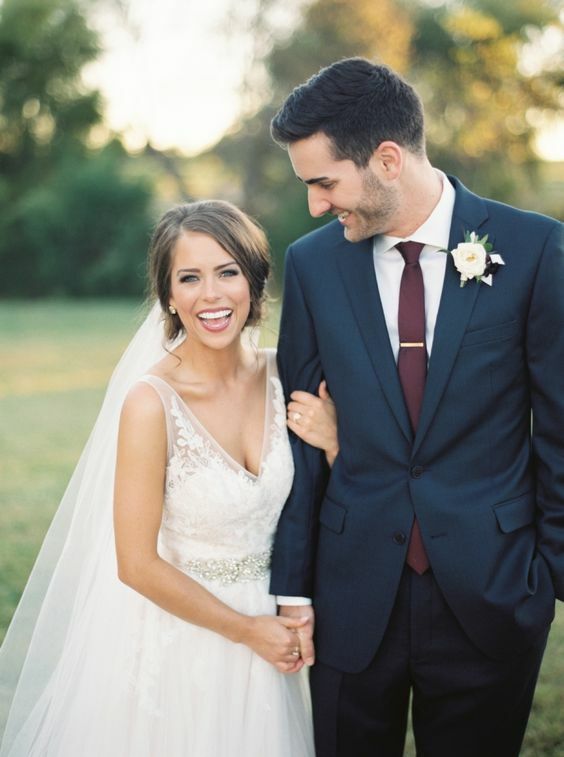 If you are a dapper gent who doesn’t know what to wear for his fall wedding, it’s not a problem – I have some tips and a whole bunch of ideas for you! 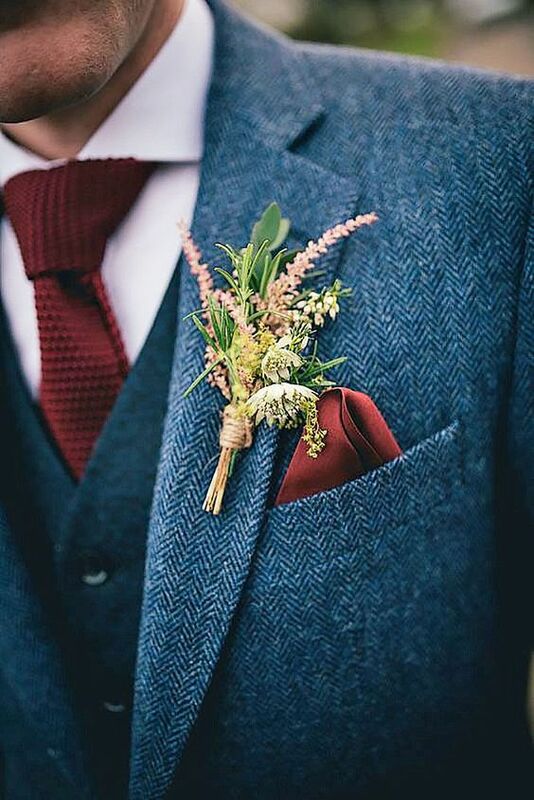 First of all, pay attention to comfy and warm fabrics – tweed in on top, it’s only super trendy because of the stylish vintage-inspired look, it’s also very warm and ideal for cold seasons. 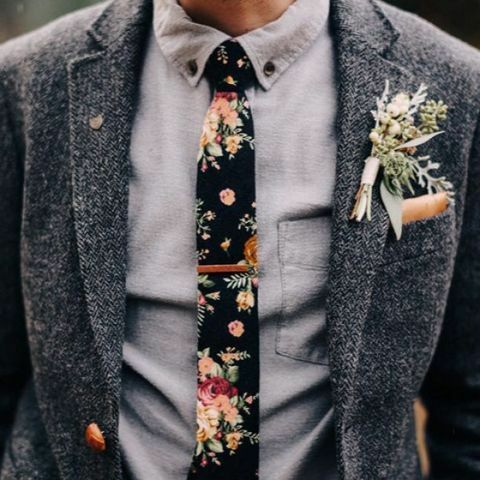 Second, try to create a layered look if you know that it’ll be cold: layering isn’t only fashionable for any outfits now, it will help you feel warm and comfy. 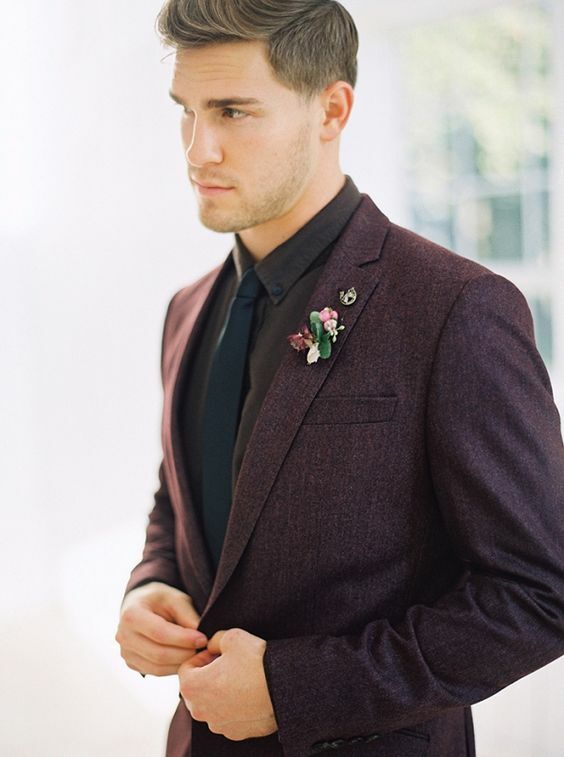 Third, fall is the season of bold shades, so when choosing a color, don’t limit yourself to calm shades, try something bold, too: plum, burgundy, cobalt blue and so on – if not a suit, then at least some accessories. 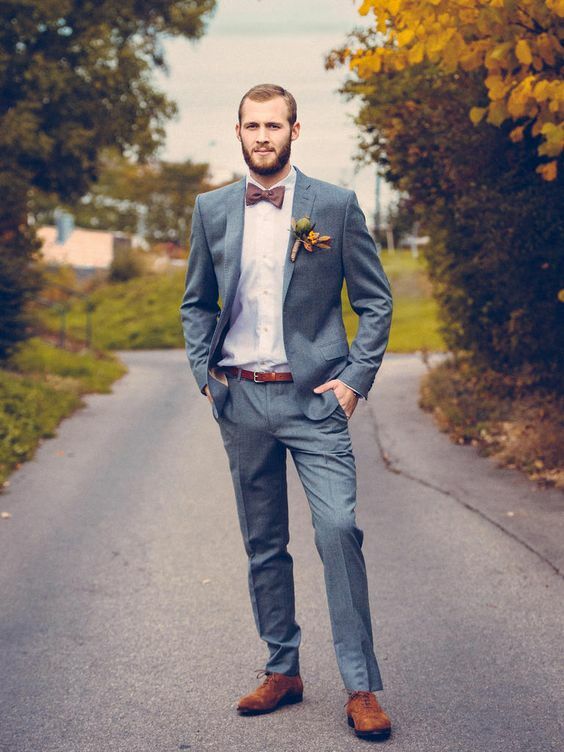 Now let’s have a look at some awesome ideas. 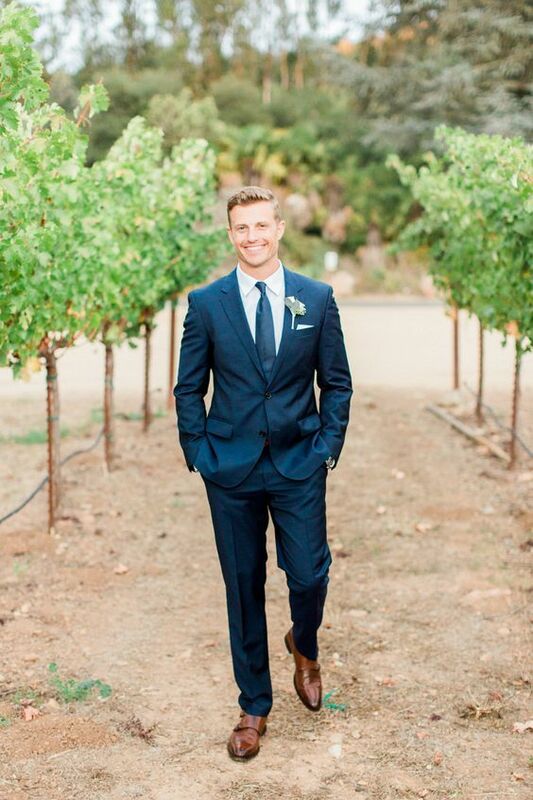 If you want to feel more relaxed, opt for a two piece suit or pants and a jacket depending on the style you want. 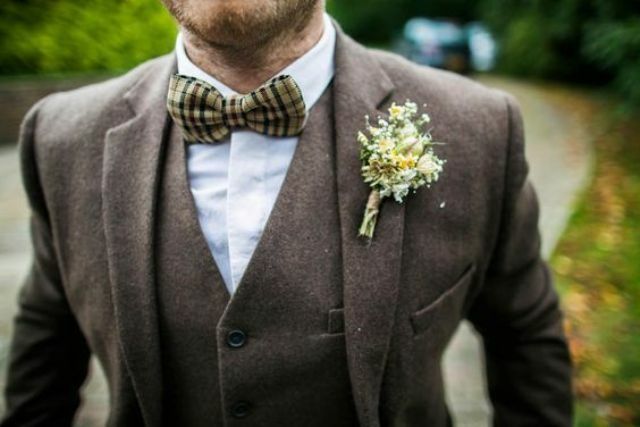 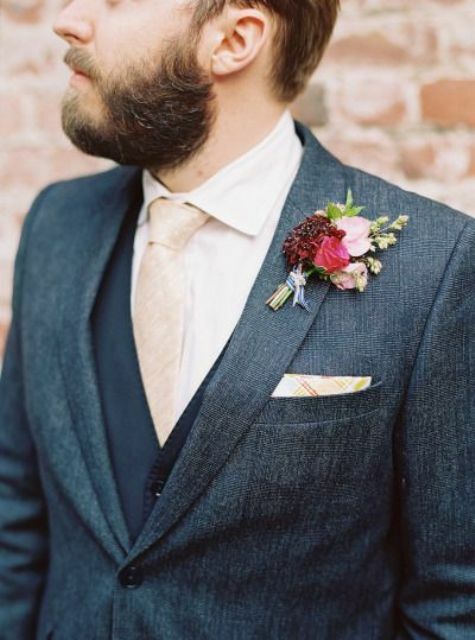 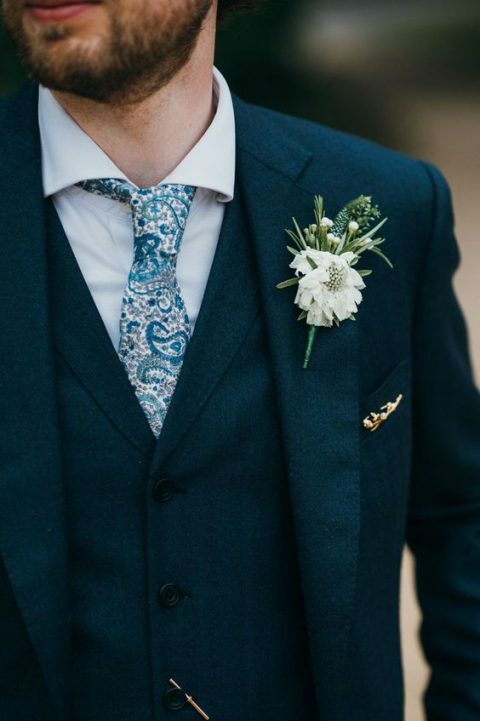 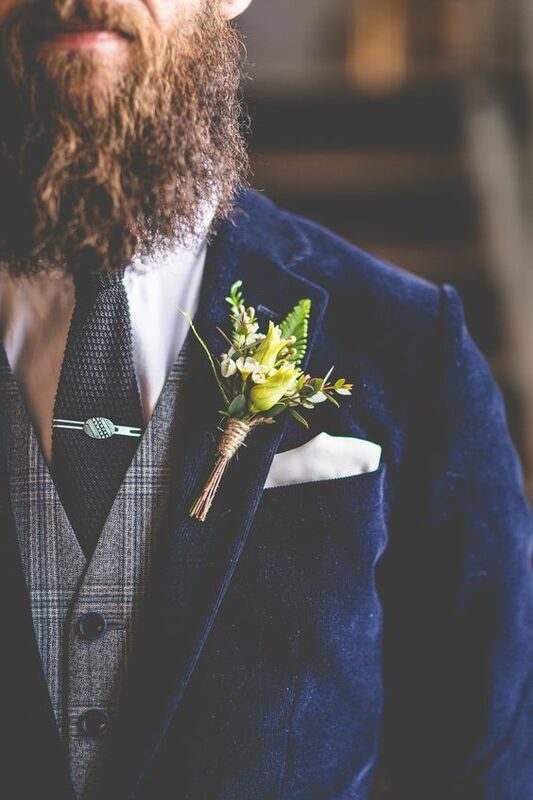 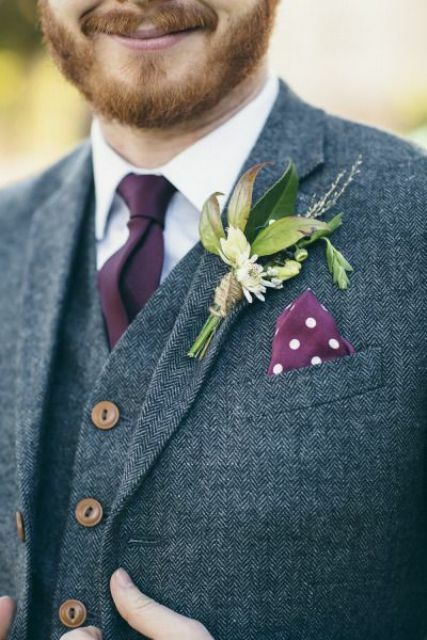 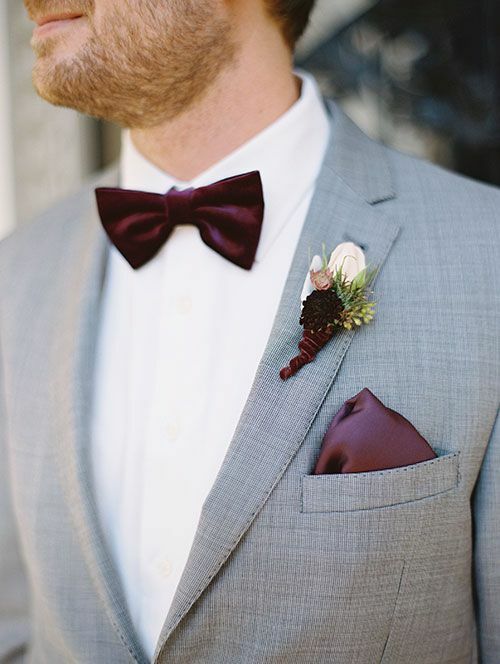 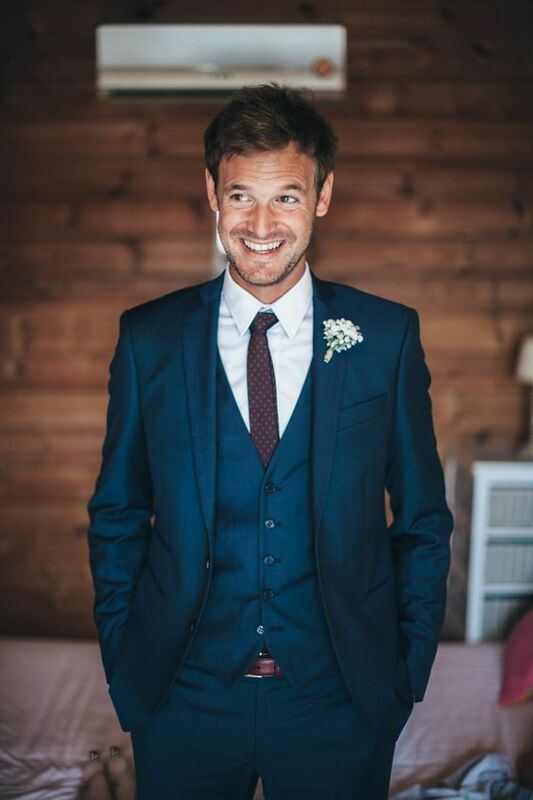 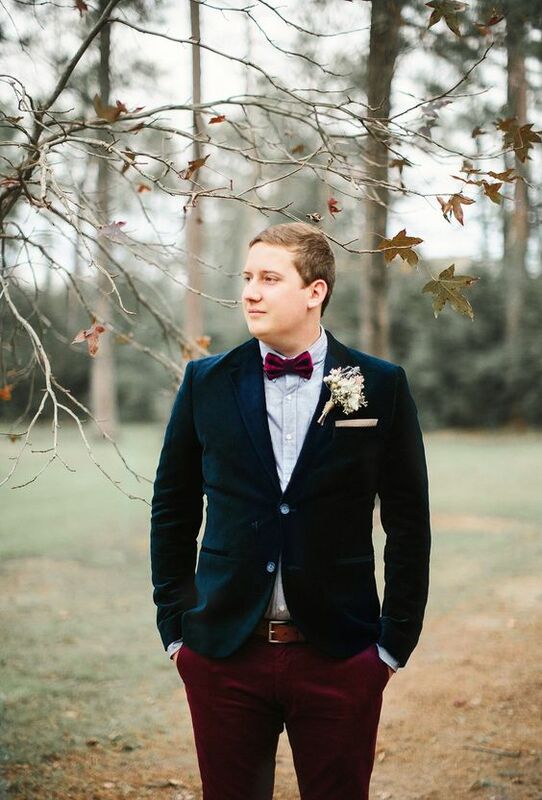 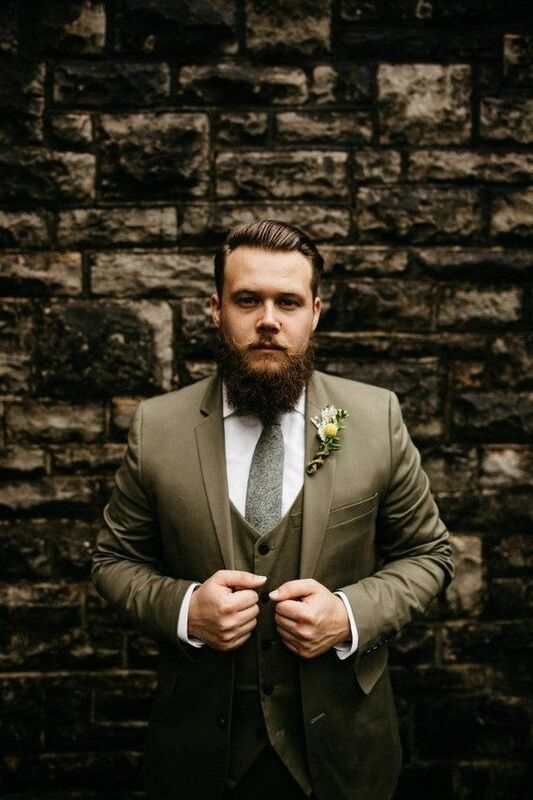 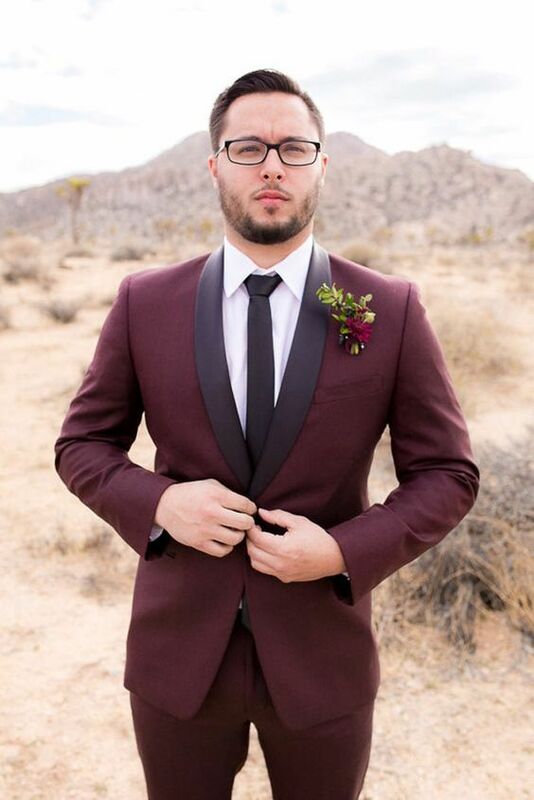 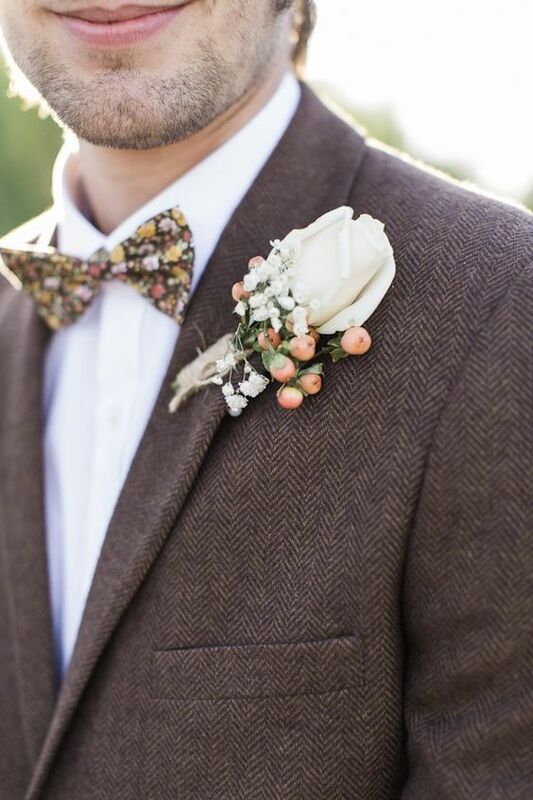 If you want a more elegant look, choose a suit, a tie or a bow tie and a boutonniere of your choice. 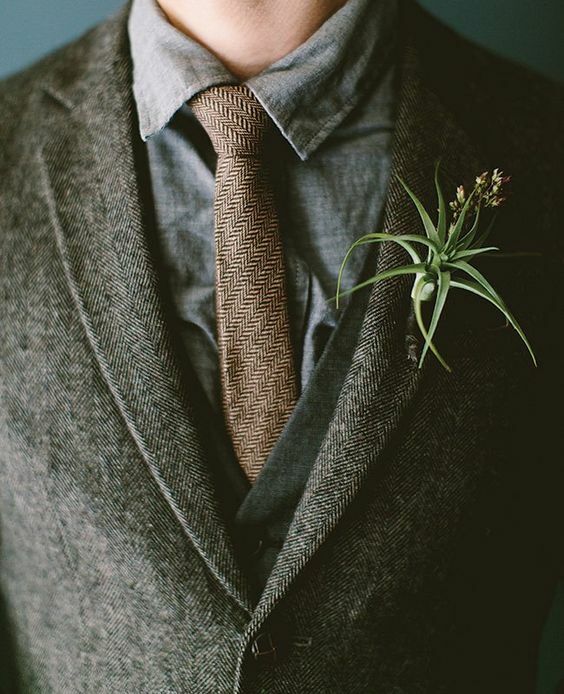 If you want a boho or very relaxed look, wear pants, a jacket and a shirt, no tie. 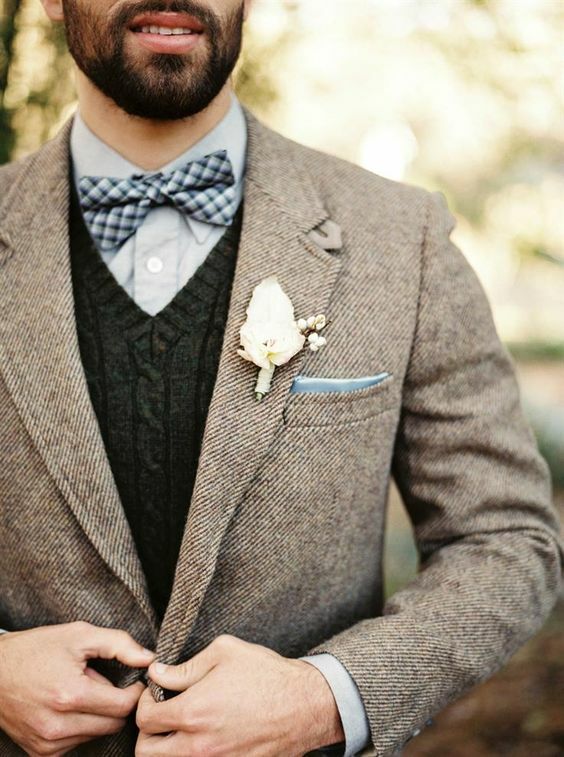 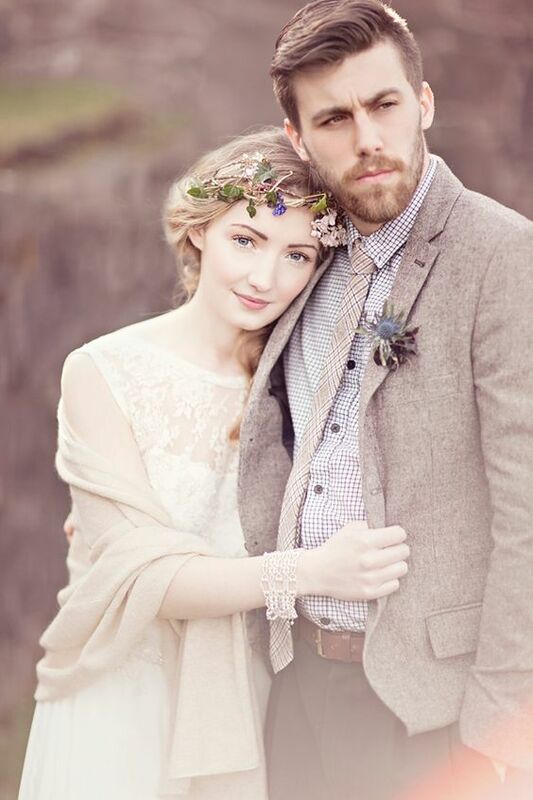 If you know that it’s gonna be cold, choose tweed or even wool to wear, it’ll be perfect for any outdoor shots. 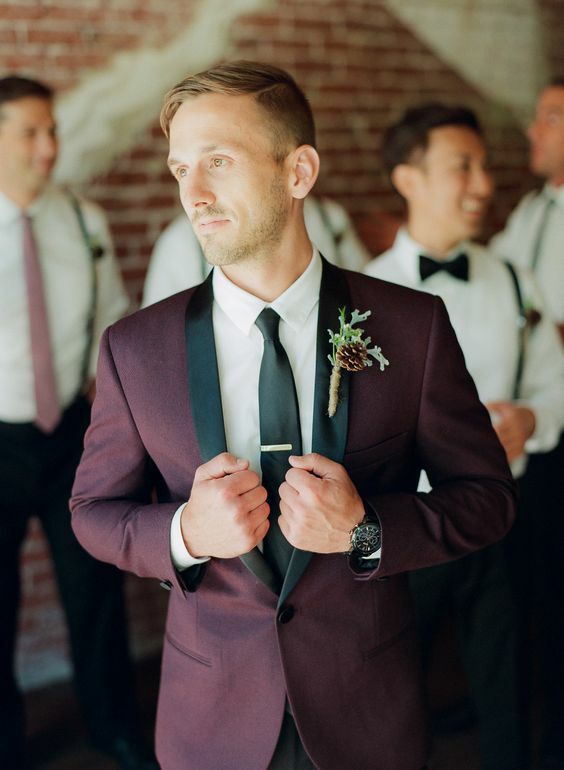 Velvet is the trend of this season, so pay attention to it, especially in sumptuous fall colors like plum, burgundy or emerald. 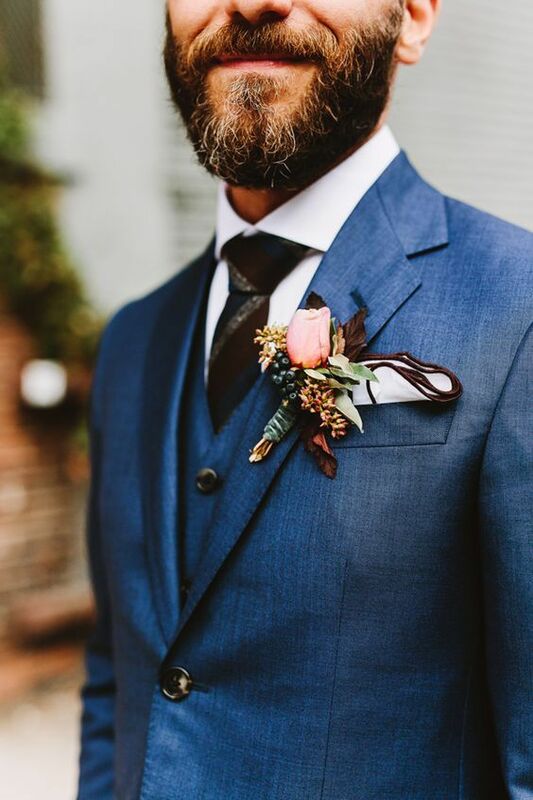 Consider fall colors: navy blue, cobalt blue, light and dark grey, light and dark brown, burgundy, plum and beige, or any other that you like. 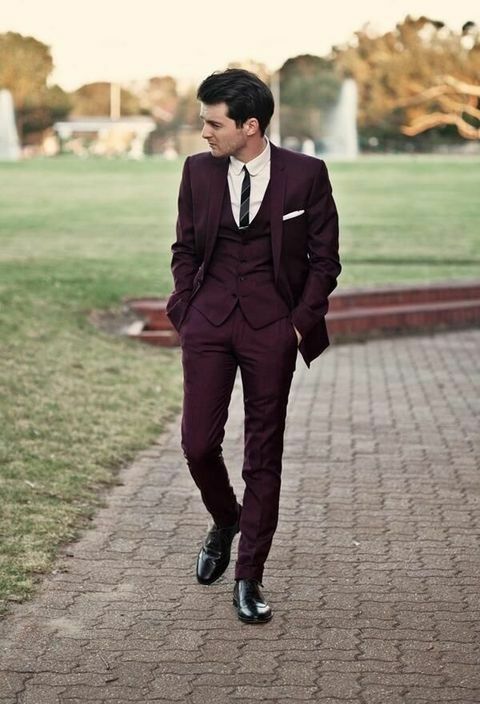 Don’t be afraid of contrasting accessories: plum, maroon, burgundy and red or emerald ones, the fall is the time to stand out. 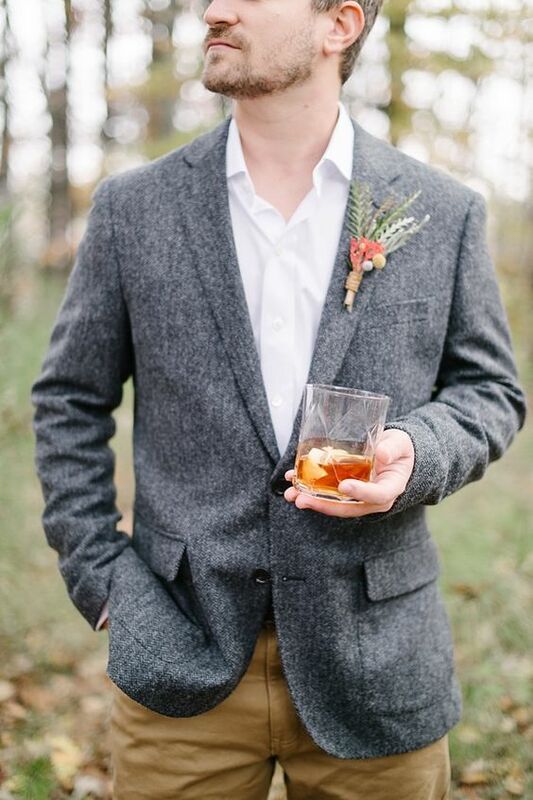 A three piece suit is a great idea for a layered fall look, it’s a guarantee that you’ll feel cozy, whatever weather you’ll have. 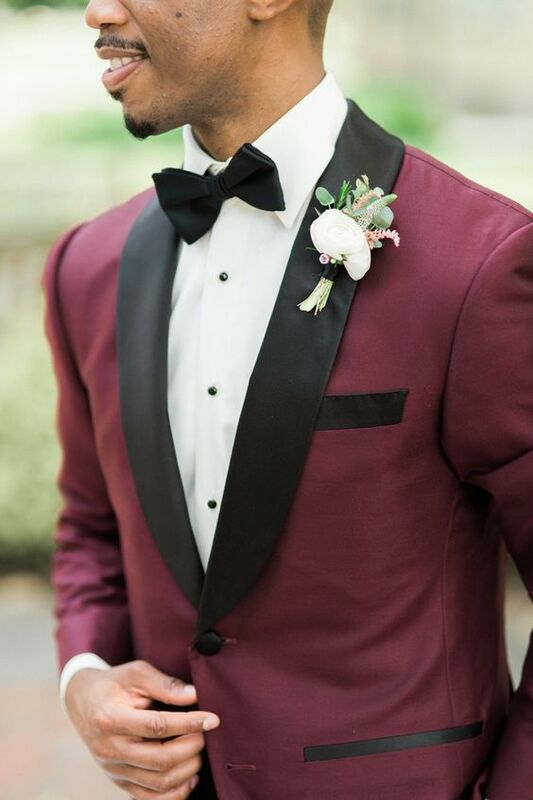 Here you don’t have to choose any warm fabrics, and in case you’ll feel hot inside, you can just take off the jacket and still look dapper. 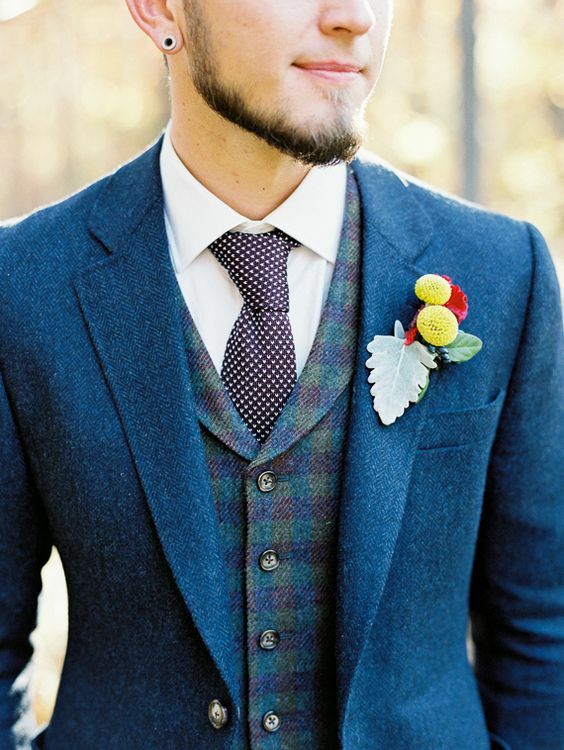 The vest can be of a different color or texture for more eye-catchiness. 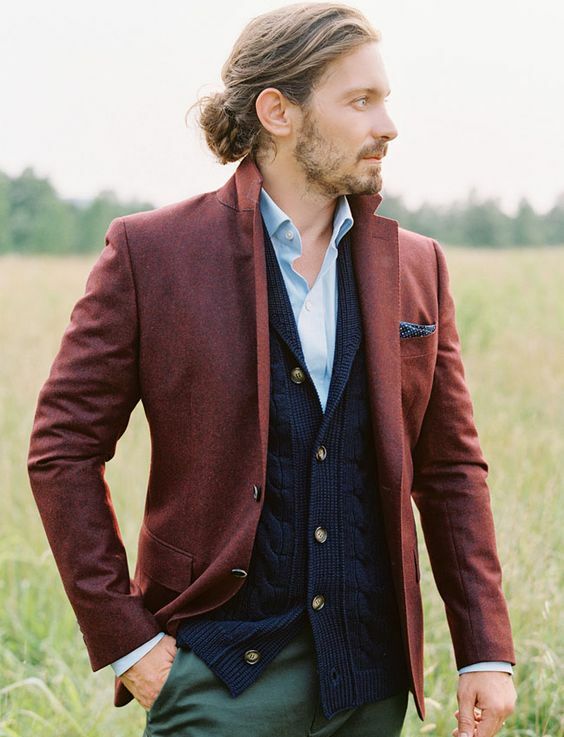 If you want a relaxed boho look, choose a jacket, vest and pants of different colors and maybe fabrics for a gorgeous layered outfit. 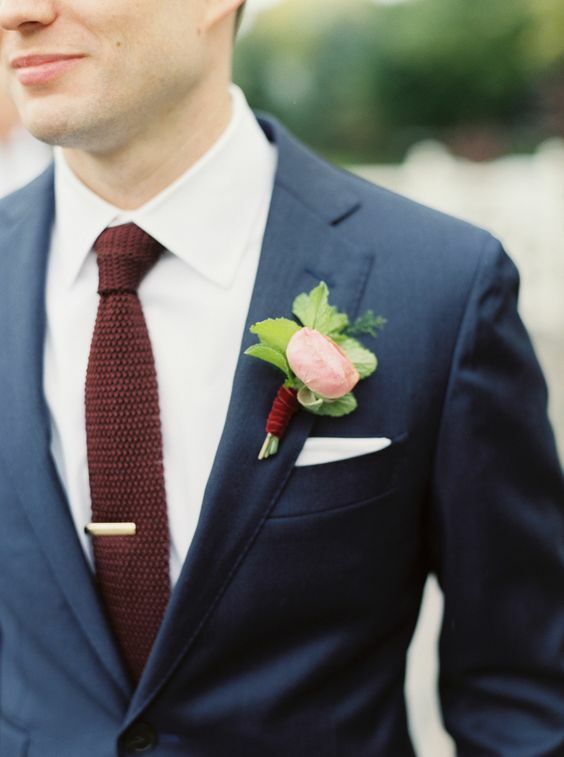 No tie is necessary in this case – you may even go for a scarf to feel warmer.